I know it might sound weird but making dinosaur Christmas cookies is a good way to entertain the kiddos until you are ready to open gifts. 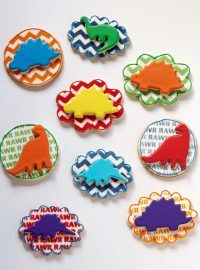 Especially if the dinosaur Christmas cookies are the Paint Your Own Cookies you can make with one of those really cool stencils. I am in love with these things. They make cookie decorating easy. The best part is watching the kiddos paint the dinosaur Christmas Cookies. If it is anything like my grandson painting the Thanksgiving cookies then this is going to be a lot of fun. Just don’t forget to make a few extra cookies for the adults. They will have so much fun they will feel like a kid again. Santa Hat Cookie Cutter-I am not sure where I got the second Santa hat cutter but any Santa hat cutter will work. Stocking Cookie Cutter This is the Santa Cookie Cutter that Started it All for me! I paid over $60 and it is on Amazon for $12! Just saying! Thick White Icing placed in a piping bag fitted with a coupler and a #233 grass decorating tip. The icing needs to be thick enough to hold it’s shape. Stencil Genie or Magnets to hold the stencil in place. Begin by baking a batch of your favorite cookies and cut out some Santa hats, stockings, a few rectangles for the paint pallets, and plaque shapes. 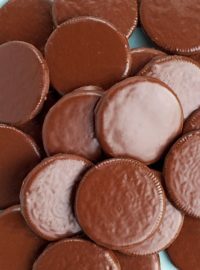 If you need a good cookie recipe or a royal icing recipe, follow the links under the supply list. If you are using the PYO Stencils, make sure the stencils will fit on your cutters before you bake them. Then, outline and flood them with the white 15 Second Icing and let them dry overnight. 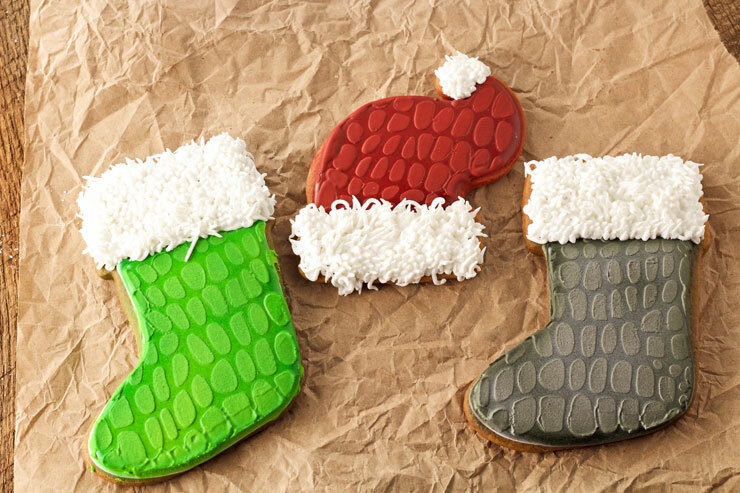 Once your cookies are baked, iced and are completely dry, place the PYO Santa Stencil in the Stencil Genie or use the magnets to hold it in place. Place the Stencil Genie over the cookie so the stencil is in the center of the cookie. Place some black icing on the stencil above or beside the Santa cut out. Use the stencil scraper to pull the icing across the stencil. Hold the stencil in place so it doesn’t move or it will blur the image. Then, carefully lift the Stencil Genie straight up off of the cookies. Repeat the same steps for the dinosaur stencils. Place the stencils into the Stencil Genie and add icing to the top or side of the image. 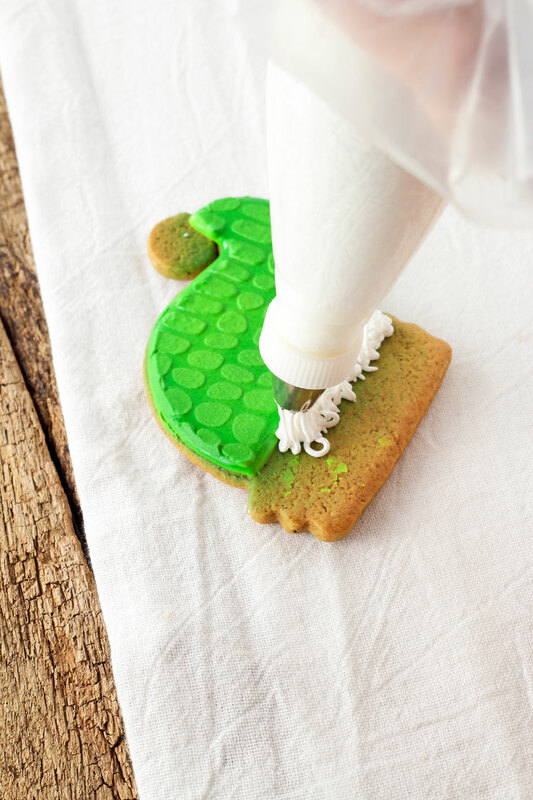 Spread the icing with the stencil scraper. Lift the Stencil Genie straight off of the cookie so you don’t smear the icing. Repeat for the long neck dinosaur PYO Stencil. After you lift the stencil and Stencil Genie off of the cookies you may need to wash your stencil in between each use. If not, there could be some icing on the back that might smear onto your cookie before you even start to transfer the pattern. To make the paint pallet cookie, place a small amount of food gel colors to a plate. Dip a round sponge brush into one of the colors and gently press it onto the cookie. Wash the sponge out and repeat for the rest of the colors. Outline the hat with the green, gray or red icing. I am just going to show the green icing for this tutorial. 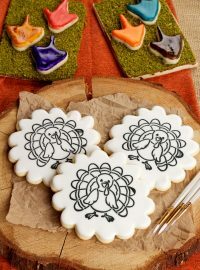 Let the cookie dry completely before you start stenciling. Next, place the reptile skin stencil in the stencil genie and place it on top of the hat cookie. Place some icing onto the top of the stencil. Spread the icing over the cookie with the stencil scraper. Lift the stencil straight off of the cookie. Optional-You can stencil the edges of the cookies if you want. I think it adds a little something, something but you don’t have to. If you want to know how to airbrush a cookie you can watch this How to Make Chocolate Chip Cookies video. Add the fur with the thick white icing and the #233 tip to the ball of the hat and the brim. Place the tip close to the hat and apply pressure to the bag. As the icing falls onto the cookie continue pressure. When the icing starts to look like fur and is as long as you want, break it by releasing pressure and giving the bag a quick jerk. Work your way around hat brim until it is all covered. Repeat for the ball of the hat. Repeat the steps for the fur on all of the hats and stockings. 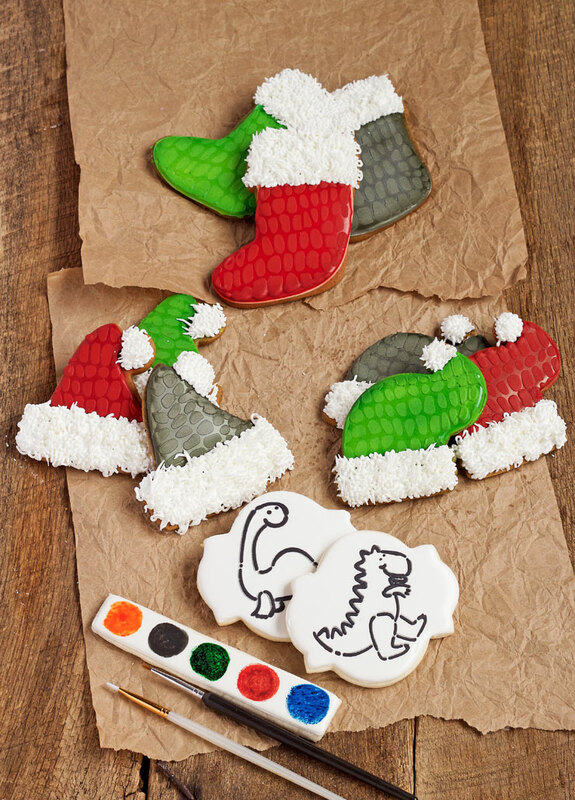 I don’t know about you but they didn’t have fun crafty paint your own dinosaur Christmas Cookies or any play with your food treats like this when I was a kid. I wish they did because it would have saved me hours of shaking my gifts to see if I could guess what was inside. My grandson loved the Paint Your Own Cookies for Thanksgiving so much that he painted one until the icing almost dissolved. Since he had so much fun I decided we don’t have to wait until his birthday to make more. 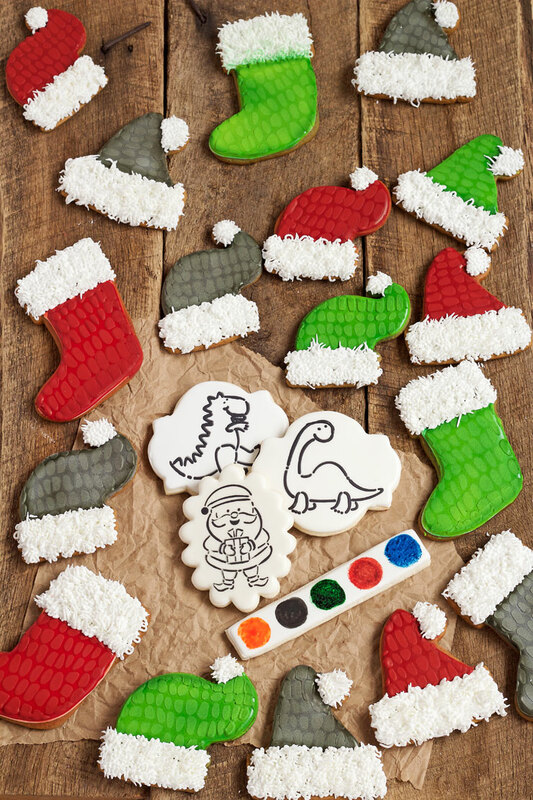 He likes dinosaurs so I thought adding a few Christmas cookies, a Santa and some Dinosaur PYO Cookies would make him happy and give him something to do until it is time to open the gifts. I know he is going to be thrilled. Don’t you love the texture of the reptile skin stencil? I like the way it pulled this set together and will help make the holidays more fun. This is a great way to spread Christmas cheer. 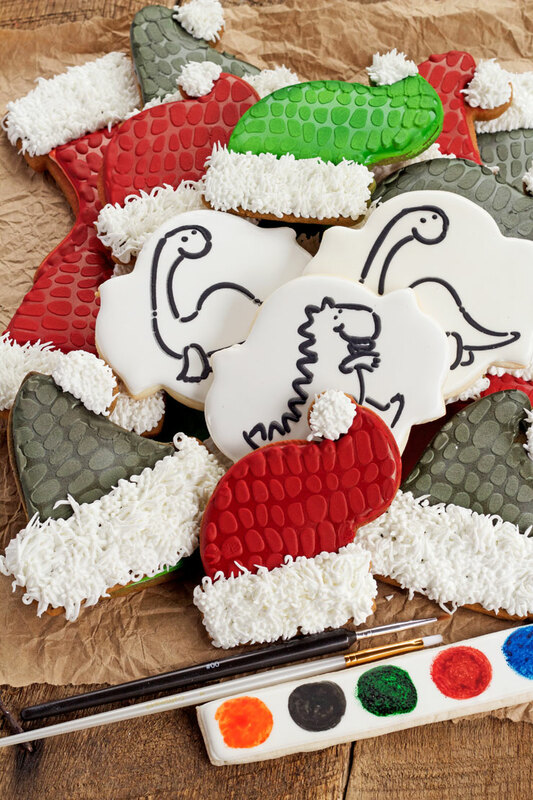 Dinosaur Christmas Cookies in December is going to be a new tradition at my house. Thanks Anne! I can’t wait to see how my grandson paints them. 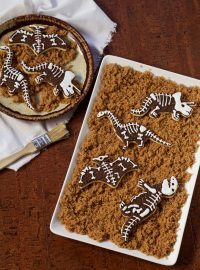 I have a few little guys in mind who would think these were DINO MITE! Do they dip the brush in water then into whatever color they want to paint on the cookie? Also, doesn’t the black run if it gets wet? Do you have any finished painted cookies that you can post? The kiddos or adults dip the brush in water, they blot off some of the excess water onto a paper towel and then pick up some paint from the paint palette. The color goes on very easy. If they touch the black outline, it should be alright but if they keep touching it you will get a gray or black smear onto the other colors. I really don’t worry about it because as long as the kids are having fun it doesn’t matter if the cookies are perfect or not. How long does it to for the pallet to dry?